Bleeding from biting and chewing site. Calluses formation due to hardening of skin as a result of biting. The color of skin changes to red due to excessive and repetitive biting. Blisters formed which causes pain and bleeding further. Compulsion behavior i.e. patient feel it compulsory to bite his nails and skin around it and could not stop himself from biting. Patient have low self esteem. Ridges are formed on the skin which clearly indicate the presence of dermatophagia. Skin discoloration: due to repetitive biting, the color of skin changes and becomes colorless. Normally it is seen around nails. Skin discoloration occurs when biting fingertips become habit and patient do it on daily basis with repetitive action. Patient do not even notice it because he fine it hard to stop biting his skin. Patient experience a pleasure feeling like a dream come true while biting. Bleeding: when patient bite his skin on fingers again and again, the skin may get damage and bleeding starts. Bleeding is considered an obvious sign of dermatophagia. Bleeding is the worst condition of dermatophagia and sometimes patient still do not stop biting even after bleeding. Skin damage: the skin surface become hard and tough due to repetitive biting, patient with dermatophagia have scars on the skin surface usually around the nails. Skin become damage and looks like patient have cuts on skin surface. Calluses: when patient bite his skin again and again without any hesitation and break then skin start becoming hard and start changing its shape. Calluses form as a result. These calluses will lead to the formation of wounds. Infection can easily occur in these open wounds and lead to further complications. Ridges on skin: when patient chew and bite his finger tips, the skin surface start turning hard and as a result ridges are formed. These ridges are considered a visible sign of dermatophagia like bleeding. All these sign and symptoms mentioned above are related to dermatophagia and no instrument or test are required to diagnose this disorder. Dermatophagia is a medical condition which lies under the heading of obsessive compulsive disorder OCD. Dermatophagia is derived from two Greek words i.e. derma means skin and phagia means to eat. In this condition patient bite and chew his skin. People with this anxiety disorder are known as wolf biters. People suffering from dermatophagia, usually bite their nails, cuticles, nail folds and hangnails. Other than fingertips, patient bite his cheeks skin from inside of mouth. Cut his lips also. People usually start by biting and chewing skin around nails and then start chewing other parts. People do this to relax themselves when they are under stress conditions. When patient is mentally disturbed, he find it pleasure to bite and chew his skin around nails. It is kind of relaxing to them. Patient experience combined feeling of pain and pleasure. This is uncontrollable and patient find it difficult to stop biting and chewing his skin. As it an anxiety disorder, so it may occur due to many reasons. Some of the common causes are discussed below. It is not just a habit, but a separate disorder with specific signs and symptoms. Stress: when patient is in mental stress and thinks a lot, unintentionally he start biting his fingertips and do it again and again. He is so into thinking that he even do not notice this. Patient find it stress relieving so he do it again and again for pleasure and relaxing. Childhood trauma: any kind of trauma or head injury may lead to mental disturbances and patient develop dermatophagia as a defensive mechanism. Genetics: genetic mutation is counted a cause behind dermatophagia. Mutation in a specific gene leads to mental disorder or mental uncomforting, so patient develop dermatophagia to combat this condition. Boredom: sometimes boredom also leads to nail biting and this nail biting leads to a severe condition i.e. chewing and biting of skin around nails. Depression; when an incident occurs in patient’s life and he can’t get rid of thinking about it, then dermatophagia works as a defensive mechanism to relax patient. When patient start biting his skin, he feels relax and comfortable. Nervousness: when patient is feeling nervous, like during an interview or on 1st meeting with any member or during presentation, they start biting their nails and skin around them to combat nervousness and anxiety they are facing. And normally they stop biting nails and skin when nervousness ends. Chemical imbalance: dermatophagia may also develop due to hormonal changes and any kind of chemical imbalance in our body. Patient behaves strange and bite his fingertips as a mind relaxing behavior. Obsession with body image: when patient feel obsession with his body physique, he feel nervousness and as a result dermatophagia develops. Patient start biting his nails and skin around them again and again until nervousness ends and patient eel mentally relaxed. All the reported possible causes of dermatophagia are mentioned above and symptoms appeared are not related to the leading cause behind it. Dermatophagia is an anxiety disorder and lies under the class of obsessive compulsive disorder. So its treatment involve two main treatment options. 1st option involve mental therapies and 2nd option consist of medical therapy. Dermatophagia cannot be cure completely but these treatment options try to lessen their urge. The psychological or mental therapies involve two main therapies named behavioral modification therapy and cognitive behavioral therapy. In case of behavioral modification therapy, the behavior of patient is changed or modified. Physician ask patient to develop another less harmful habit instead of chewing skin around the nails. Patient can also feel relax with another habit both physically and mentally. Behavior of patient can also be changed by applying a nail paint on nails with a foul smell. So whenever patient try to bite or chew his skin around nails, will smell a bad odor and stop biting. This will help a lot in treating or limiting this anxiety disorder. Artificial nails can also be used to treat dermatophagia. Another therapy named cognitive behavioral therapy is also used to relax mind in dermatophagia. It is the leading therapy in treating psychological conditions. In this therapy patient is allowed to ask about his habit of chewing nails and skin around it. When patient open up and discuss every thing with physician, they set a goal and slowly try to get rid of this disorder reaching to that specific goal decided. Now comes the medical therapy in which this disorder is treated with medicines. But this therapy is not used alone but in combination with other psychological therapies. In this therapy, medicines are used like antidepressants. These antidepressants depress the mental activity and allow the patient to relax. Patient will no longer think about society and relax mentally and physically. But physician have to monitor patient on daily basis for drug abuse or drug over use. Dermatophagia is getting common day by day i.e. every 2 out of 7 patients are suffering from dermatophagia. People with dermatophagia uncontrollably bite or chew their skin around nails so sometimes due to this reason this disorder remains undiagnosed. People with dermatophagia feel embarrassment in public while biting their nails and skin around nails. So these patient require treatment. This condition is not really easy to treat or stop on short notice. Treatment of dermatophagia takes time in months or even in years. There may be many causes behind dermatophagia like genetics, trauma, injury and many more. If this condition is left untreated, it may get worse and cause further complications like infection at biting site. Patient have to get emotionally recover to combat this disorder. Treatment of dermatophagia is necessary and the abovementioned therapies helps a lot for this purpose. Other than these above mentioned therapies, patient have to control himself willingly during depression phase. Others can also help patient from getting rid of this anxiety disorder. Treating this disorder will show some positive and some negative effects on patient according to the treatment option selected. Dermatophagia is an anxiety disorder in which patient bite and chew his skin when he is suffering from anxiety. Patient eats his fingers again and again until bleeding starts. Blood oozing out of biting site makes patient comfortable and relax. With the passage of time this disorder become worse. Excessive biting and chewing leads to cuts and scars on skin and infection can occur at that site. Patient feel mentally relaxed while biting and chewing his skin. Normally patient with dermatophagia bite and chew his skin on fingertips and skin around nails and joints. Patient also commonly chew skin of cheeks from inside of mouth. Lip biting is another form of dermatophagia. There may be many causes behind that disorder and treatment is designed according to the leading cause behind it. Patient follow behavioral therapy and habit changing therapy to quit and treat this disorder. Treating this anxiety disorder will take longer because it is related to mental condition, so therapies work slowly in months and sometimes in years. Patient may get fully recover in a year. Recovery time may vary person to person and according to worsening of disorder. People use different remedies to get rid of this disorder and these remedies do work. Patient start avoiding skin biting and chewing and with the passage of time patient start getting rid of this disorder. When patient bite and chew his skin again and again scars and cuts appear on skin. These cuts allow blood to rinse from them. Some patients even after bleeding do not stop and continue biting their skin for relaxing and comforting. This makes the scars and cuts worse. Patient have to contact doctor immediately to avoid infection at biting site. Doctor immediately apply cotton and pyodine on blood and tie a bandage over it. Blood stop oozing out but these scars take time to heal properly. Healing time may vary in days and months. The deep cuts take more time to heal completely. Doctor may have to change dressing for 2 to 3 times until it completely heal and skin start recovering. Healing time vary from person to person. Some people skin have awesome healing power and get completely heal in few days. Sometimes patient take months to get completely healed skin. Healing time also depend upon patients will to recover from dermatophagia. Therapy effectiveness is another factor effecting healing time. Patient have to try hard because recovering from this disorder is not an easy task. Along with medical therapy, patient have to continue behavioral therapy as well. Some remedies are also used to treat dermatophagia like wearing finger coverings and chewing bubble gum all the time or applying nail paints with bitter taste and foul smell. All these remedies help patient to recover fast than usual time. Sometimes using medical therapy makes patient comfortable and stop him from biting and chewing skin but when patient stop taking anti depressants, this disorder again become heavy and patient start chewing his skin. So all these above mentioned therapies are compulsary to use with medical therapy. 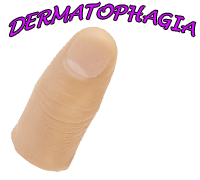 Dermatophagia is derived from 2 greek words i.e. derma means skin and phagia means eating. Official definition of dermatophagia is “ it is a compulsion disorder, in which patient gnaw or eat his own skin, commonly fingers are involved.” it is an anxiety disorder, in which patient eat his skin during thinking. Patient start eating his skin around nails and joints of fingers and skin of cheeks from inside mouth. Lip biting and chewing is another form of dermatophagia. Sometimes excessive biting leads to bleeding and discoloration of skin. Skin turns red at biting site and sometimes blisters are formed. Dermatophagia is counted an anxiety disorder. It is said so, because patient bite or chew his skin when he is anxious and facing a problem in life. When patient thinks deeply, he unintentionally start biting his fingers and chew them or bite his skin in mouth and skin on lips. This is uncontrollable and patient find it hard to stop biting. Patient have a pleasure feeling while eating his skin. Behavioral therapies and habit changing therapies help in reducing this disorder. It is a mental disorder, that's why antidepressants are used to suppress mind functionality, which in turn relaxes patients mind and stop dermatophagia. Patient with dermatophagia may have discolored skin around nails and knuckles. Because excessive biting leads to discoloration of skin and swelling. Patient may bite continuously his fingers and knuckles that blood comes out of skin leading to infection. The skin become red around knuckles which clearly show presence of dermatophagia. People with this disorder, start from skin around nails and gradually start biting knuckles of every finger one by one. If bleeding occurs in 1 finger, then patient uncontrollably start biting another finger. As a result, fingers got discolored skin at knuckles. Dermatophagia disorder is divided into 3 main types according to behavior of patient. There are three types of people having dermatophagia. Type 1 involve those people who eat or chew their nails and skin around them. These patients bite off their nails and skin with them. But not let blood comes out. Type 2 involve patients who eat their skin only and do not bite off their nails. Skin discoloration may occur in this type of people but bleeding is rare. In type 3 people with dermatophagia have bleeding fingers and knuckles. Bleeding occurs due to excessive biting and blister formation on biting site. Dermatophagia causes people to bite and chew their skin which in turn leads to scarring or cuts on biting site. From these cuts blood ooze out. So first aid is required on urgent note. Blood is cleared with an antiseptic and bandage is applied on these cuts. This bandage also helps to stop patient from biting their skin. These cuts will recover in almost 1 week and bandage is removed for natural healing process. But some patient do not wait for complete healing and start biting that site again. Which may make it worse.